This will be my last post until the fall, when I start blogging about my 2019 thru-hike. Yes, 2019. I have decided to defer my thru-hike until next year. I am disappointed, but not so much regretful as wistful. However, as soon as I made the decision I felt deep relief. I have had several things nagging at me, driving me to look repeatedly at the calendar and to examine the value of flip-flops or section hikes, generally trying to find some way to make the hike fit into my greater priorities. I am free now of those doubts and worries. I am grateful that I saw the wisdom of giving myself another 13 months or so to get really, really fit and do a lot more hiking and backpacking. I have heard many contradictory opinions about long-distance hiking; one is whether it’s fine to let the trail “get you in shape” versus being in shape when you get there. Now that I have let go of my original departure date, I revel in my paradigm shift: I now believe that once I master the basic skills of long-distance hiking and get myself in good physical shape, then and only then will I learn what the trail has to offer. For some, probably mostly younger people, the reward is in the physical challenge. I agree, but I’d prefer that the challenge be something more than trying to haul my fat a** up the next incline. What else prompted the new plan? I’ll preface my reply by noting that I got in a little trouble with an earlier, politically-oriented post. I apologize to the Trek editors and to readers whom I offended with the post, which I have since taken down. I won’t re-hash the subject, but the post essentially reflected my conflict about leaving the matrix for six months during a year of events that I am passionate about. That is the primary reason I am deferring my thru-hike. I don’t want 2018 to go by without my being involved. Enough said. Another motivator is that this will be my beloved cat’s last year. Her declining health has taken my focus away from my original start date of February 26. I didn’t want to leave knowing she would die while I was on trail, but I didn’t want to put off the hike because she was dying. Again, it has been a sweet relief to know that by staying home this year I will be here when she passes. I will be part of the decision to put her to sleep and I will be able to give her whatever comfort and pampering I can as she struggles with arthritic pain. 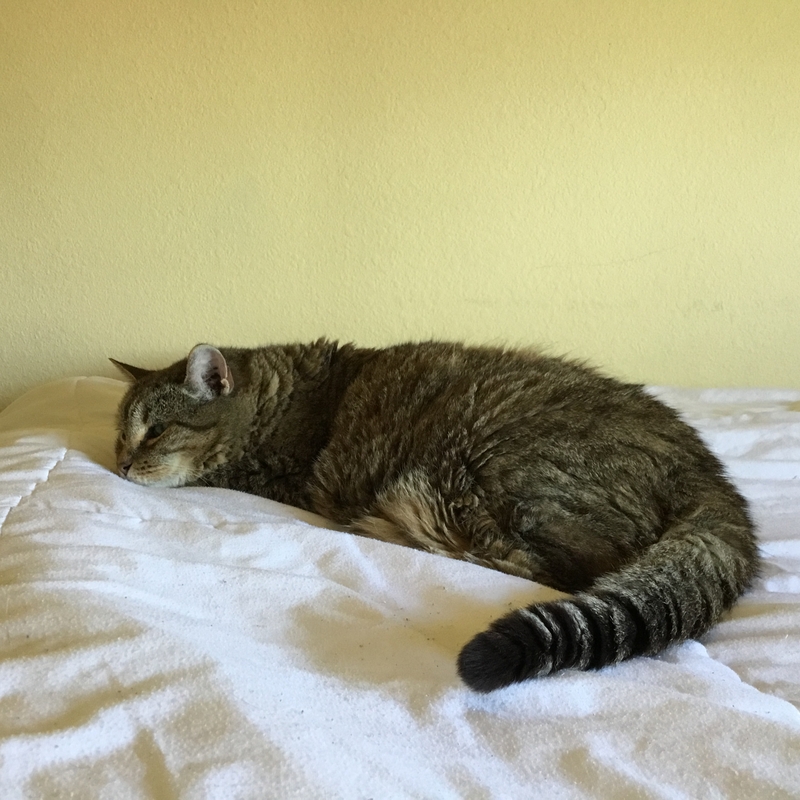 She is laying on my bed as I write this, her eyes squinted, her breathing fast, as she tries to groom the fur she can no longer reach, on her back and sides, because of her pain. I tried last night to brush it out but it was irredeemably matted in some places and fell out in others, as copious dandruff sloughed off her skin. Come February I will either be huddled over the cat trying to ease her pain and maintain her dignity or I will be grieving. I lost my mom last February and losing the cat within the same year is going to be tough. At a different time the AT might have been cathartic and healing. This year I doubt it would be. Unlike Cheryl Strayed, I have neither the youth nor the recklessness to throw my grief at the trail. So I’m going to do my thing this year, while endeavoring to be maximally able to experience the alternating splendor and harshness of the AT. I have a clearer picture in my mind and a deeper comprehension in my heart of what the thru-hike will mean to me. As the class of 2018 begins coming off the trail, I will be gearing up in earnest for 2019. I think I will be a smarter and more sophisticated blogger then. I will have a lot more to talk about than forgetting to take my food out of my bear canister (dumb) and not being able to figure out how to put my tent up (trite). Those are the matters of a half-hearted thru-hiker. I do not wish to be half-hearted and, God willing, I won’t. Because I wanted to do the AT before I turn 60, my husband jumped on board and we are starting our NOBO on 3/16/18. We are nominal hikers and have never backpacked, so we will definitely be learning and getting in shape as we go! Unlike you, I look forward to getting away from the political frenzy and unkindness coming from both sides for a while. 🙂 Sorry about your ailing pet, and Good Luck on your 2019 hike! As they say, hike your own hike – on the trail and in life.